WASHINGTON—Stating they felt deeply unnerved by the community’s unwavering and impassioned defense of a football program and administration that enabled child sexual abuse over the course of several decades, the rest of the country informed Penn State University Friday that there is clearly something very wrong with all of them. The nation’s nearly 320 million citizens all confirmed that the Penn State community’s repeated denials of the school’s culpability, continued displays of reverence for their former football head coach Joe Paterno, and failure to meaningfully acknowledge and respect the victims suggest that they share a very warped perspective on the world and may indeed be suffering from some kind of serious mental health condition. 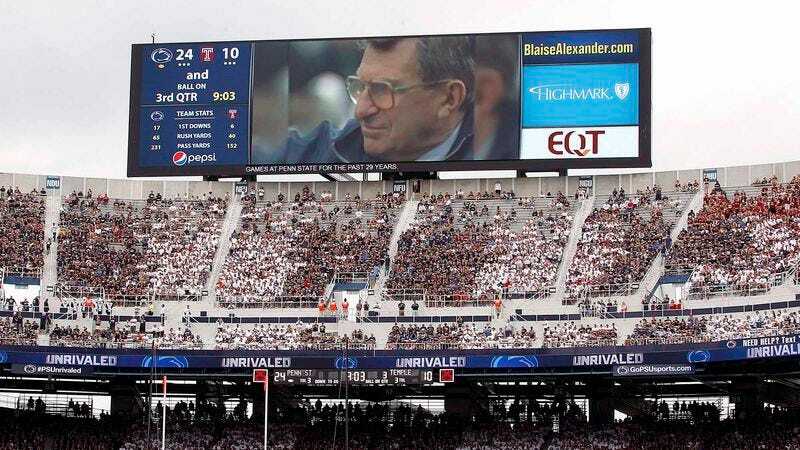 According to reports, residents of all 50 states concurred that only a group of people who lack the most basic sense of self-awareness and decency could whitewash Joe Paterno’s enormous failures while continuing to celebrate his achievements in football. Millions of Americans also repeatedly stressed that Paterno’s decades of off-the-field charity work does not mitigate the damage he caused, and anyone who believes that it does has a dangerously distorted view of reality. The entire populace emphasized that they were “very, very troubled” by suggestions from those affiliated with Penn State that only Sandusky is to blame, and that the university was unfairly targeted at the expense of players and coaches who had nothing to do with the scandal. Focusing on all of those things, rather than the many children molested by one of their coaches, is very bad and very odd, according to virtually every single person outside of State College, PA.
Americans went on to say that it would take an extremely sick and troubled mind to read the findings in the Freeh Report and then somehow disagree with Paterno’s immediate firing, while furthermore still believing in restoring his 111 victories confiscated by the NCAA.